Here's Rochelle's all pink wedding cake. The set-up included a three layered center cake with gerbera sugar flowers. On top is a bride and groom topper. 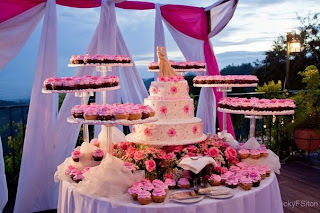 Surrounding it are rose cupcakes arranged in glass stands and more cupcakes on the bottom of the cake.